Terrorist activities impact on the rights of people as they undermine the ability of people to enjoy their right to life, liberty and fundamental freedoms. In addition to the human cost, the activities of terrorists can destabilize governments, peace, security and economic activities. 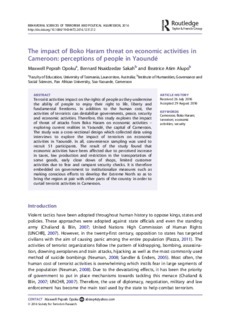 Therefore, this study explores the impact of threat of attacks from Boko Haram on economic activities – exploring current realities in Yaoundé, the capital of Cameroon. The study was a cross-sectional design which collected data using interviews to explore the impact of terrorism on economic activities in Yaoundé. In all, convenience sampling was used to recruit 51 participants. The result of the study found that economic activities have been affected due to perceived increase in taxes, low production and restriction in the transportation of some goods, early close down of shops, limited customer activities due to fear and rampant security checks. It is therefore embedded on government to institutionalize measures such as making conscious efforts to develop the Extreme North so as to bring the region at pair with other parts of the country in order to curtail terrorist activities in Cameroon.